The process for creating spirits in Vinsight will vary depending on the physical processes involved in creating the particular spirit. In this document we will discuss the various processes (operations) available within Vinsight. We outline an example process of making a whisky. Receive bulk product into a vessel (Receivals). Create new product in vessel (Create Batch). Transfer product from one vessel to another (Transfers). Add ingredients to product in a vessel (Additions). Adjust the volume of a vessel (Adjustments). Despatch product in bulk (Despatches). These processes are explained in more detail in the following pages: Bulk Operations. Transfers, Adjustments and Additions, Topping Operations, Bulk Inserting Vessels and Additives, Bulk Despatch. 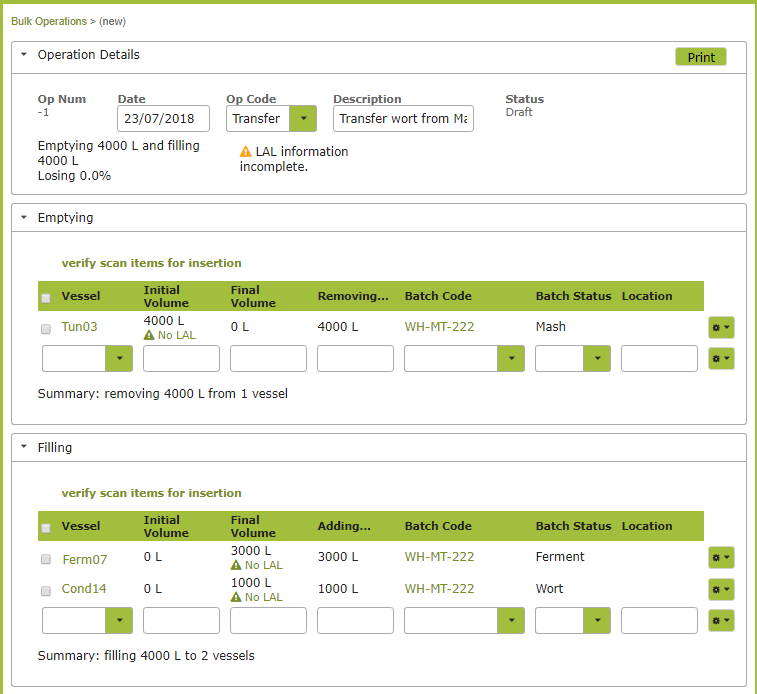 Vinsight will track the blend information of each vessel as you carry out these processes. 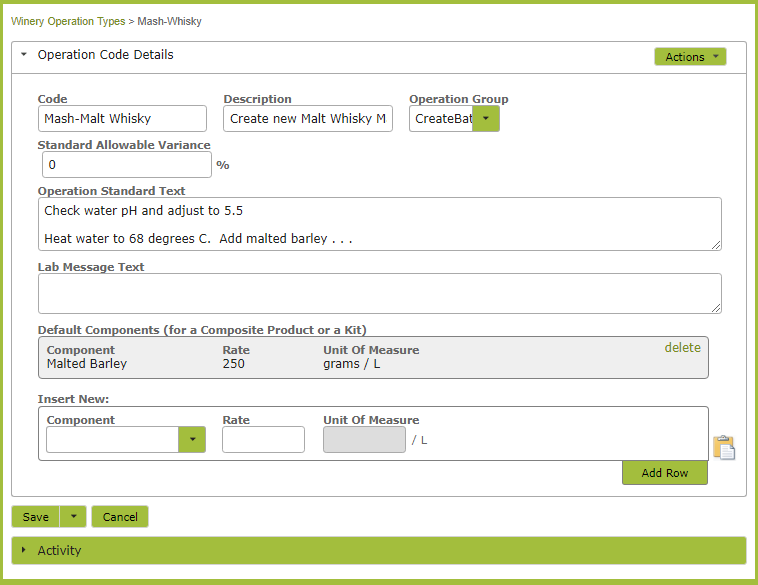 In the following example we use the features in the ‘Make’ part of the menu to create a mash, ferment and distill whisky. This example should give you some idea as to how to set up the processes for your own distillery. How many steps should I record? There is a lot of flexibility around the number of steps you record (as operations) during the production process. For example, when creating your blend, you could “create” a batch straight into a fermentation tank, or, alternatively, create a mash into a Mash Tun, and use a second operation to transfer the resulting wort to a fermentation tank. Similarly in the distilling process, you could create a transfer directly from the fermentation tank to three tanks containing the resulting hearts, heads & tails, or you could, first transfer to the still, and then create a second transfer operation to move the distilled product into tanks. It all depends on how you run your business and which information is important for you to track. We generally advocate keeping it as simple as possible, i.e. if one operation is sufficient to convey all the information you need, don’t complicate things by splitting it into two. 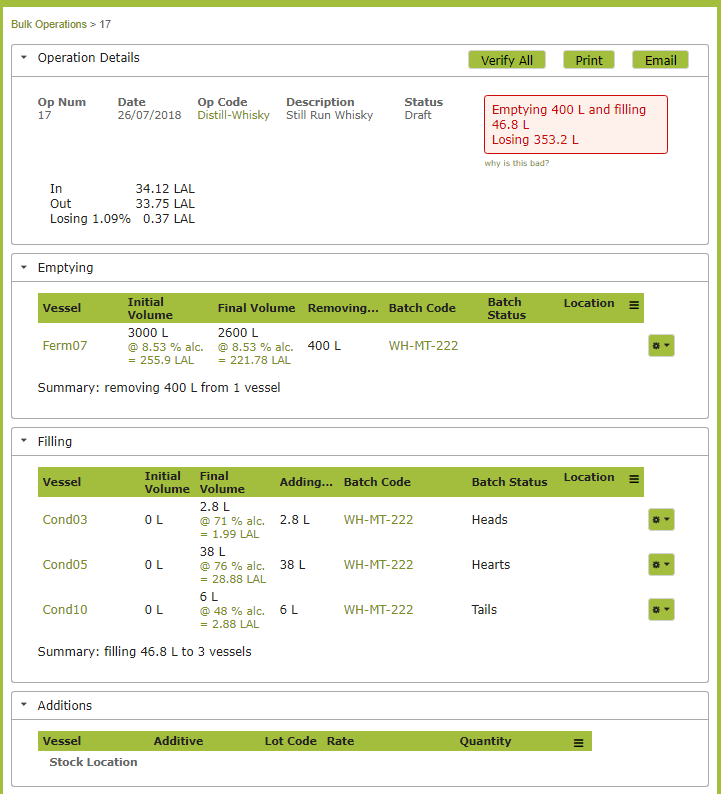 While you can use the default operations such as ‘Transfer’, ‘Addition’, or ‘Create Batch’ to create blends, if you are performing a process that has repeated ingredients or instructions, it is worth taking the time to set up some custom operations that incorporate those instructions and ingredients. Go to Settings > Operation Types and click ‘New’. The ‘Code’ is the value you will use to pull up this recipe when completing operations. Ensure that it readily identifies the recipe in question. If the Operation involves transferring existing bulk from another tank, set Operation Group to ‘Transfer”. If the Operation is to fill a tank from scratch set the Operation Group to “Create Batch”. If the Operation is to add ingredients to an existing tank, set the Operation Group to “Additions”. Add any instructions to the Operation Standard Text area. Finally insert all ingredients and the rate at which they should be added in the ‘Default Components’ section at the bottom. As the operation we are demonstrating here involves filling a tank from scratch, we will set the Operation Group to Create Batch. Here we only have one default component but you can add as many as required. Once you have the recipe set up you can use it any time you create that product. You will not have to go through this process again, unless you are changing an existing recipe or adding a new one. Once set up, you can use a recipe to create your spirit. Go to the Make > Bulk Operations area and click “New”. 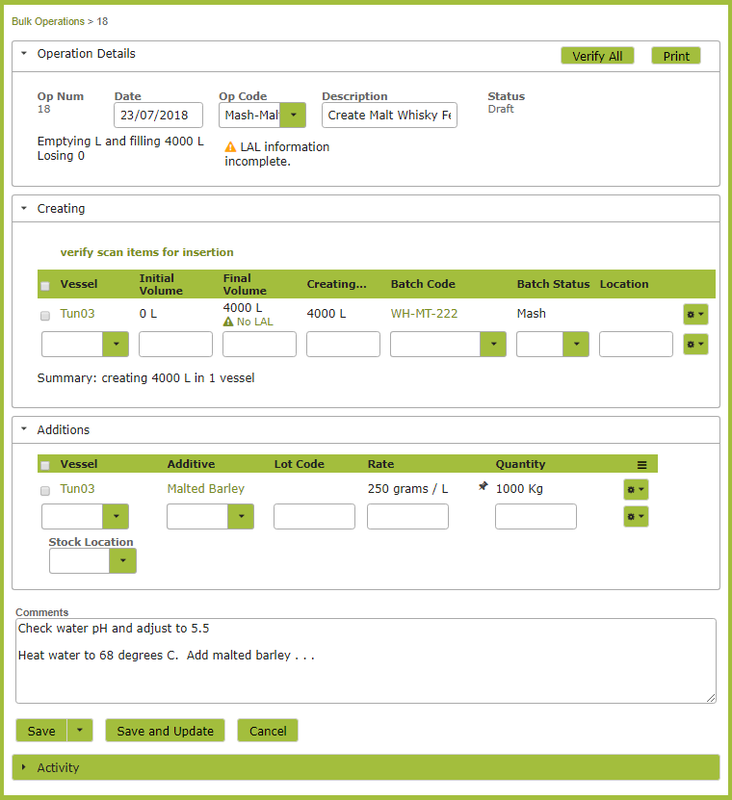 Complete the form, ensuring you select the Op Code that relates to your recipe from the Op Code drop down list. Once you select a vessel to fill, the pre-set ingredients will appear in the additions area of the page. The App will calculate the quantity of each ingredient required, depending on the volume you are dealing with. The instructions you set up in the Operation Type, will appear in the ‘Comments’ area of the page. In the following operation we transfer the wort that is of sufficient quality to the fermentation tank, while the remainder is transferred to a second tank for possible re-use. Alternatively, you could use just one operation and create the ferment directly in the Fermentation tank. This would give you a sufficient starting point if you didn’t need to e.g. track malt being re-used in a further process. 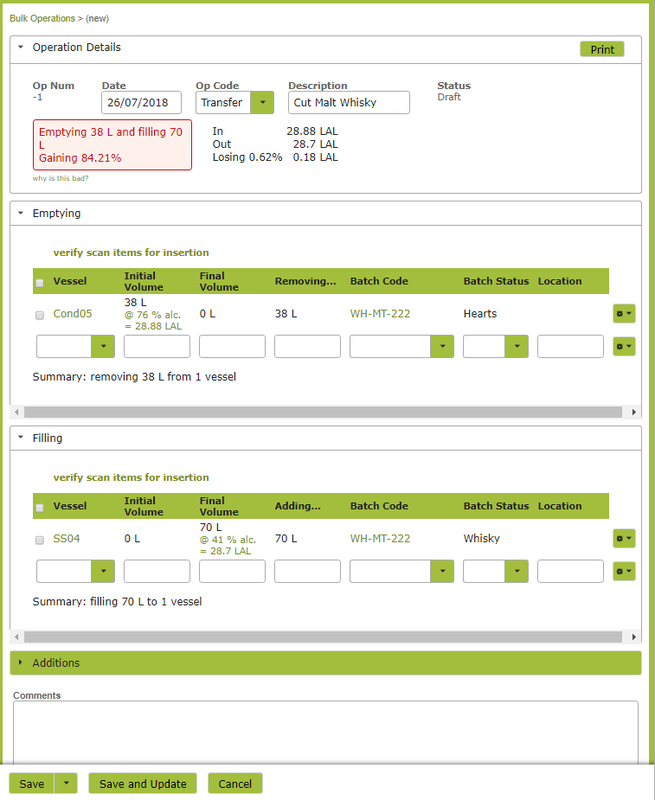 As the whisky is fermenting, record measurements in the Analyze > Ferments area of the App. For detailed information as to how this part of the App works, see Ferments. Finally, in our whisky example, we will want to record the distillation of the spirit. In the following example we have created a ‘Distill Whisky’ Operation Type (i.e. a ‘recipe’), before creating the operation itself. If there were no standard instructions you wanted to include, a ‘Transfer’ Op Code would achieve the same thing. Here we record the distilling process as a single transfer from the Fermentation tank into three storage tanks, containing hearts, heads & tails. In reality, you will likely be transferring the fermented product into a Still before it is finally separated into heads, hearts and tails. If it is important to you to know which Still is used or there are other measurements information you wish to record in this process, you could make the transfer to the Still and the subsequent transfer to the three storage tanks, two separate operations. The App will warn you of the significant change of volume and require you to provide a reason for this before updating the operation. Here the variance reason would be “Ev-Evaporation”. When you ‘update’ this operation, the change in volume will create a warning and require you to enter a reason for this variance. As the change here is due to the addition of water, you would select ‘Ad-Addition gain’ as the reason for the variance. For information on bottling your product, see “Bottling your Spirits – Quick Overview“.